I like salty snacks. Many people crave sweets, but I crave salty, crunchiness. There is nothing like a good quality crispy potato chip (the kettle cooked are the best). Since I try not to eat that stuff these days, I am always looking for a healthy alternative. Spicy and/or salty nuts are always great, but I get bored with nuts. 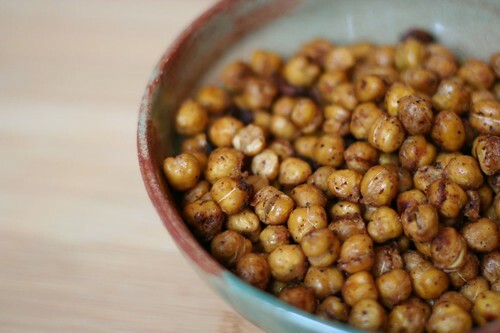 These roasted chickpeas are just as delicious as any potato chip or nut (if not more) and they have the perfect amount of crunch. The perfect toss in your mouth snack, great with cocktails and beers. I could sit down and eat so many of these. It’s nice they are so low in calories and they are a great source of fiber. I decided to make a big tray of these to have around during the holidays since the nibbling and munching is so much more prevalent this time of year. Now when I have that urge, I can just grab a handful of these and be totally satisfied. You can play around with spices and flavors on these, there are so many possibilities. Curry flavors would be great, as would garlic and rosemary, cinnamon and honey, wasabi and soy, sage and garlic, etc. etc. etc. The combinations really are endless. Have fun and if you are like me, once you’ve made these, you will always want to have them on hand. I plan to have a batch of these in the pantry at all times, they are a great healthy snack option for us salty craving nibblers. Pour the chickpeas in a colander, rinse with running water, drain very well and pat dry. Toss the chickpeas in the olive oil, pepper mix, salt and lime juice. Make sure they are well coated. 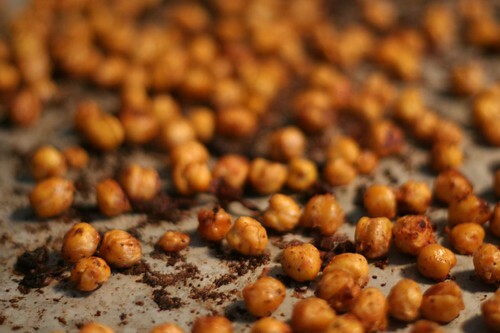 Spread the chickpeas out evenly on a large baking sheet. Roast for 30-40 minutes or until browned and crispy. Turn and toss with a spatula every 10 minutes so they don’t burn or stick. Taste and add more salt or peppers if needed. 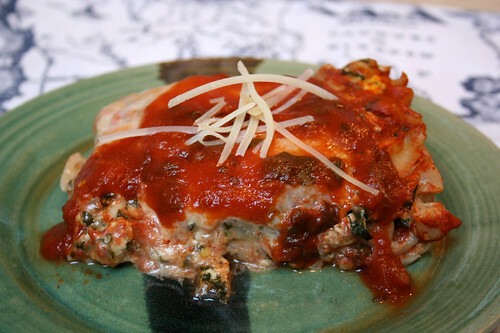 I’ve been making this lasagna recipe for years, it’s so simple and very delicious. It is best with a homemade sauce, but if you don’t have any on hand, a store-bought sauce will do. I would like to try it at some point this winter with homemade gluten-free pasta. I think that would set this recipe over the top. This lasagna is easy to make and if you are a household of 2, like we are, this provides 4 meals throughout the week. I love those types of meals this time of year. Something you can make on Sunday and eat through the week. Preheat oven to 400º. Cook lasagna noodles according to package directions. In a medium bowl, whisk together ricotta cheese, eggs, 1/2 teaspoon salt, 1/4 teaspoon pepper and 1/4 teaspoon crushed red pepper flakes. Add spinach and 1/2 cup of Parmigiano-Reggiano cheese, stir well to combine. 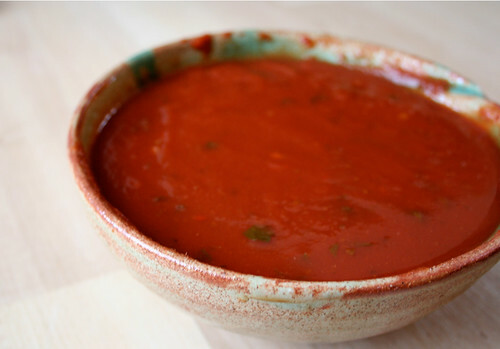 Spread a small bit of tomato sauce in the bottom of a 9-by-13-inch glass baking dish. Arrange a layer of lasagna noodles on top. Spread 1/3 of the ricotta mixture over the noodles, followed by 1/3 of the remaining sauce; sprinkle with 1/3 of the grated cheese. Repeat to make two more layers, ending with cheese. If freezing, cover tightly with plastic wrap. Before baking, defrost in the refrigerator overnight. Cover with aluminum foil. Bake 30 minutes. Remove foil; continue baking until top is golden brown, about 15 minutes more. Let cool slightly before serving. Top each piece with a sprinkle of shredded parmesan reggiano cheese. Enjoy. With it being winter and the opportunity to cook with fresh tomatoes is long past, this is the most delicious way to make the best of using store-bought canned tomatoes. This is a variation on my mom’s classic tomato sauce recipe that she has been making forever. It is so delicious. I remember being a kid and sneaking into the kitchen to steal spoonfuls, sometimes I would even ladle some into a small bowl and eat it like soup. There is so much flavor, a hint of spice and it is so easy and inexpensive to make. It had been a very long time since I had made this, so I decided to make a big pot since I had planned on making lasagna with it. Sometimes my mom would cook meatballs and or sausage in with the sauce, that gave it even more flavor. I decided to use fresh herbs since they looked pretty decent at the market and I buy organic tomatoes. My mom never has, and subsequently I don’t, measure the spices on this. I add to taste. As it simmers, taste it, does it need more italian seasoning? Like a bit more heat? Add more red pepper flakes. You can add a glug of red wine or even a tablespoon or two of sugar if you like your sauce a bit sweeter. You can make a large amount of this and freeze it for later, like I do. I made it for lasagna and froze what we didn’t use. Combine all ingredients in a large pot and simmer 2 – 3 hours. Serve over your favorite pasta, use in lasagna, or allow it to cool and refrigerate or freeze it for later. That’s it, really. Ice cream isn’t typically something I think of during the cold of winter, especially with how cold it has been here. 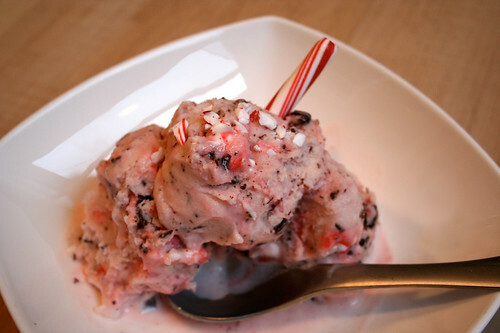 However, I have been thinking about an ice cream that features candy canes, they are a Christmas classic and I knew not only would it taste amazing, it would look so beautiful. I am in love with vegan ice creams and how easy they are to make. I made the Pumpkin Spice ice cream a while back and it was so incredible that I wanted to go that route again this time. I especially love how much more light it is, you aren’t left with that terrible feeling in your stomach from eating a massive bowl of dairy. I added in the peppermint extract in addition to vanilla, to really highlight the mint flavor, but if you want it to be a bit more subtle and just highlight the mint flavor from the candy, just leave it out and simply go with the vanilla. If you are wanting to be certain this is totally vegan, as I did, make sure to choose a vegan dark chocolate such as Green and Black’s, many chocolates contain dairy. You can also skip the chocolate all together, if you wish. 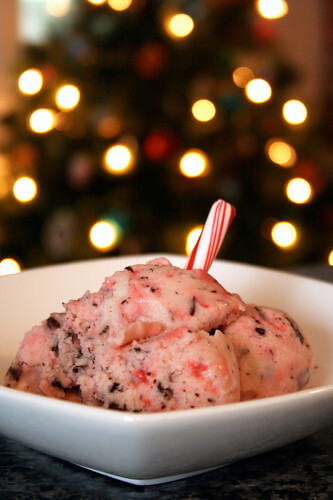 I love how this ice cream just tastes like the holidays and though it is cold out, couldn’t be any more perfect for dessert this time of year. In a large bowl, combine coconut milk, almond milk, cane sugar, vanilla extract, and peppermint extract, whisk together well. Refrigerate for at least 2 hours. Once chilled, make according to your ice cream maker‘s instructions. Add in peppermint pieces and chocolate chunks just before your machine’s freezing cycle is finished and allow to incorporate thoroughly. I find that putting the ice cream in the freezer for at least an hour after to allow it to get a bit harder is best. 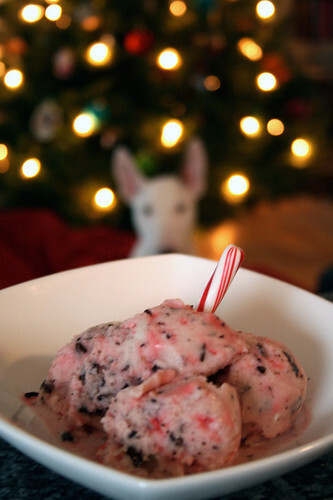 Pull it out a few minutes before serving, scoop and top with a little candy cane or a few crushed candy cane pieces. Enjoy! Even though the ice cream is very blurry in this photo, I couldn’t help but share this photo. That is our little girl, Seri. She is going to be 4 months old this weekend! I am sure you’ll see a ton of photos with her little face in them. We rarely go out to eat anymore, we try to cook and eat at home most of the time and reserve going out to eat for special occasions. We seem to enjoy it so much more. One of my favorite things about going out to eat has always been when I find a dish I really think has potential but it just isn’t quite there, I love coming home and recreating the dish the way I would like it. On the flip side, when you are out and have the perfect dish, everything is just right, I love to still come home and recreate it my way, keeping the integrity of the elements and ingredients that made me fall in love in the first place. This past week our good friends from Toronto, Ben and Esther came up for the day and we went out for dinner. We took them to Betty’s, a wonderful home-style but eclectic restaurant in the neighborhood where our store is. Betty’s has a large menu that features local and seasonal ingredients and dishes that warm your soul just reading about them. I ordered their Vegetarian Shepherd’s Pie that had a bit of a goat cheese crust on top. I had never had goat cheese on a shepherd’s pie and it was so perfect. Everything about theirs was delightful, so much so that I found myself recreating it just a mere 3 days later. What I love most about this dish, besides how delicious it is, is the fact that you can totally make and assemble it a day or two ahead of time and hold off on the baking. It is perfect for a busy week like we are in the midst of this week. I made it all on Sunday, waited for it to cool, popped it in the fridge and pulled it out the next night. I also love how many meals it yields for the two of us, we’ve been enjoying it all week for lunches. This dish is so hearty and it is the perfect belly-warming meal for a cold winter night. The lentils provide as much protein as any meat that would traditionally be in a shepherd’s pie and it has an incredible amount of healthy goodies in it. You can easily make this vegan by substituting a non-dairy milk and a non-dairy butter in the mashed potatoes and skipping the goat cheese. Prepare the lentils. Add 1 cups of lentils to a few cups of water in a medium saucepan. Bring to a boil and allow to boil approximately 30-45 minutes until cooked. Once the lentils are cooked, drain and set aside. Meanwhile, chop and prepare all of your vegetables. In a large pot, heat the olive oil over a medium-high heat, add in the onions, celery and carrots. Saute for about 8-10 minutes, then add in the minced garlic, saute another 2 minutes. Add in your cooked lentils, fresh herbs, tomatoes and their juice, potatoes and salt and pepper to taste. Allow the mixture to simmer approximately 30-45 minutes until the veggies are no longer hard and it is nice and thick. Add in the frozen peas when there is about 10 minutes of cooking left. While your filling is cooking, peel and dice your potatoes (if they are small/medium sized, quartered are perfect), bring the potatoes to a boil in a large pot with the clove of garlic and a bit of salt, boil for 10-15 minutes until they are soft. Remove the pan from the heat and drain. Pour in approximately a 1/2 cup of milk to start (you can add more as needed), the butter and a sprinkle of kosher salt and fresh ground black pepper. Mash by hand, with a ricer or with a hand mixer. 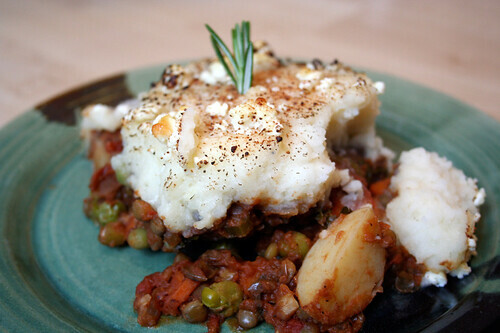 If you are going to cook and eat the shepherd’s pie right away, preheat your oven to 375º. Transfer the lentil mixture to a large 9″ x 13″ glass baking dish, spoon the mashed potato mixture on top and spread it evenly. 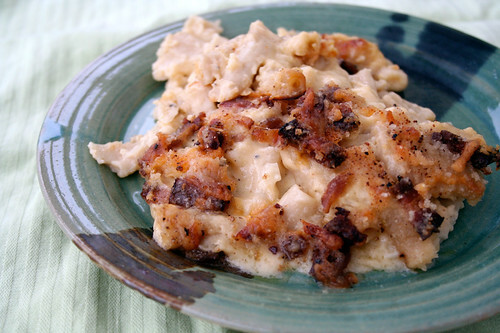 Crumble the goat cheese over the top of the entire dish and sprinkle with fresh ground nutmeg. Cook for 30 minutes or until golden and bubbling. Scoop a large portion onto each plate, garnish with a sprig of rosemary and a sprinkle of fresh nutmeg. Serve. If you are making this ahead and plan to eat it the next day, hold off on the goat cheese, allow it to cool, cover with aluminum foil and refrigerate up to a day or two. Sprinkle the goat cheese on just before baking. Baking time will increase when coming from a cool refrigerator, it may take more like 45 minutes. This is the final dish from our Thanksgiving dinner that I am able to feature. I really wanted to do a post about the gluten-free stuffing I made, but I realized after it was all gone, that I never took a photo, I swore I had. So, I plan to make that again very soon to share it with you. When thinking about what vegetable I was going to serve with dinner I knew wanted green beans, but I wanted to try something a little different. I came across this recipe while thumbing through my issue of Bon Appétit Magazine and I was thrilled to see a unique take on green beans and it was so easy. I made the vinaigrette a day ahead, which I actually think really gave it a ton of flavor, then all I had to do shortly before dinner was ready, was to cook up the beans and toast the walnuts. Super easy. I loved the tangy flavor from the cranberries and fresh mint was so refreshing. We hadn’t gotten any major snow then, so I was still able to get fresh mint from our yard. This was a nice light and flavor-packed side dish, on a day full of eating and it was great as lunch the next day. I am really unhappy with the photo, it doesn’t even begin to show how beautiful this dish was. 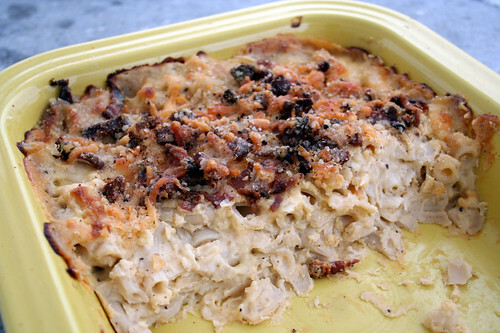 However, I didn’t want to skip sharing this recipe, because the photo wasn’t perfect. Whisk first 6 ingredients and 1/2 teaspoon pepper in small bowl. Mix in dried cherries; set aside. Fill large bowl with water and ice; set aside. Cook green beans in large pot of boiling salted water until crisp-tender, 3 to 4 minutes. Drain. Transfer to bowl with ice water; cool. Drain. 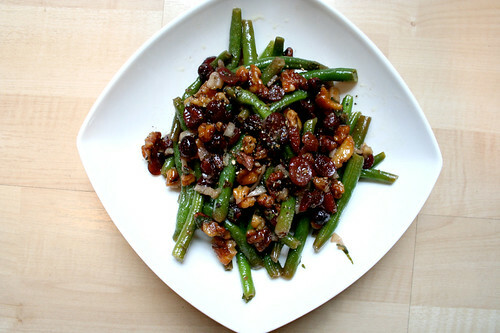 Toss green beans, walnuts, and vinaigrette in large bowl. Transfer to platter and serve. If you are preparing for a meal like Thanksgiving or Christmas, these beans are great because you can totally prepare them ahead of time, by a day. You can make the vinaigrette up to one day before. Cover; chill. Bring to room temperature; rewhisk before using. You can also make the beans the day before and wrap in paper towels; enclose in resealable plastic bag and chill. Let stand at room temperature 1 hour before continuing. You can toast the walnuts 2 hours ahead. Let stand at room temperature.